Native to Australia, the Eucalyptus is a traditional Aboriginal remedy for a variety of ailments. Today, it is used worldwide in pills, liquids, inhalers, salves, and ointments for many common problems. 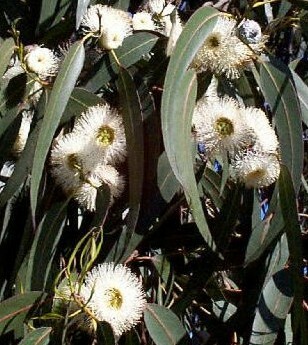 For internal use, Eucalyptus can be made into a tea or tincture. See How to Make Herbal Teas for complete instructions on teas. Teas can also be used as a gargle for relief of sore throat. To make a tincture, place 200 grams of dried or 300 grams of fresh Eucalyptus leaves in a large sterilized jar. Cover completely with rum or vodka, seal, and let sit 10-14 days, shaking the jar every few days. After two weeks, place a cheesecloth or muslin cloth over the mouth of the jar and strain the contents into a new sterilized jar. Squeeze the soaked herb to get as much of the mixture as possible. Store in a dark place and take 1 teaspoon mixed with juice or water 2-3 times per day. Externally, the antiseptic, slightly anesthetic, anti-bacterial, and warming properties of Eucalyptus make it a valuable resource treatment of burns, sores, ulcers, scrapes, boils, and wounds. Applied topically as an oil or ointment, it also helps relieve the pain of rheumatism, aching, pains, stiffness, and neuralgia. For outdoor enthusiasts, Eucalyptus rubbed into the skin seems to work well as an insect repellant, especially for mosquitoes and fleas. Rubbed into the chest, it relieves congestion and cough. Indeed, the Vick's VapoRub smell is a familiar one to most of us, and with good reason - it works! For relief of congestion, asthma, and respiratory problems, boil Eucalyptus leaves in water in a tightly covered pot, and then remove from heat and inhale the vapors. For an antiseptic bath, place Eucalyptus leaves in a mesh bag and hang under the bath faucet as you run a hot bath. CONTRAINDICATIONS: When not taken in excess, Eucalyptus is reasonably safe, but it does appear to be somewhat difficult to eliminate from the kidneys, so if you have kidney or liver problems, or if you are pregnant, it would be best to avoid it or use in extreme moderation. Never take continuously for more than a few days at a time.